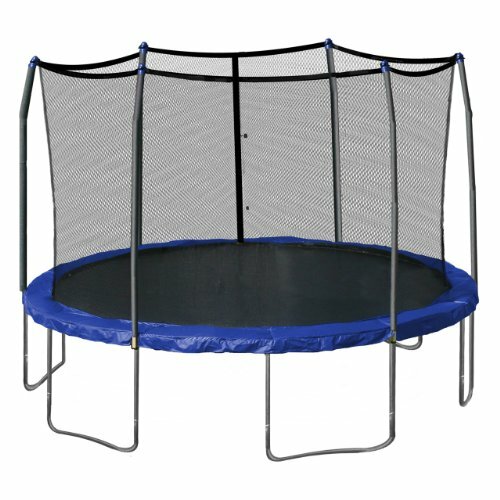 Skywalker trampolines are known for giving you the most trampoline for your money with upholding solid products. The Skywalker 15′ trampoline is likely to be the most “normal” looking trampoline to those that are making the family purchase. Why? It looks like the more like traditional style trampoline. At 15′ in diameter, this trampoline is sure to provide more than enough room for jumping excitement. Rust resistant galvanized steel utilizing t-sockets contribute to the durability of the Skywalker 15′ frame. The stay pad which is connected via a gap-free design button hole technology. This allows for the lack of ropes or threads to keep the safety pad in place. Additionally, the stay pad is constructed from UV protectant material, ensuring it last through the summer heat. Q: Do I need a trampoline cover? A: This is very much dependent on where you are located. Most people in mild climates opt to leave the trampoline uncovered, and it will withhold just fine. If you live in harsher environment especially those with snow, you may want to consider a cover or bringing the trampoline in for the winter. This will help to preserve the trampoline even longer. Q: Does the trampoline come with anchor straps or anchor spikes? Q: Can the net be replaced? A: Yes, the net can be replaced and the trampoline can even be used without the net. Although some on Amazon have stated they think this is the incorrect net, others claim to love it, but this seems to be the only replacement net. You may also want to read into the Skywalker Lower Enclosure Net, which offers a variety of uses included an outside spring target for bounc-back activities.